A mother who suffered years of physical and sexual abuse at the hands of her violent partner has said domestic abuse victims are being failed by Stormont. Terri-Louise Graham from Londonderry is angry that a law to protect victims from psychological abuse is being used in other parts of the UK but not here. 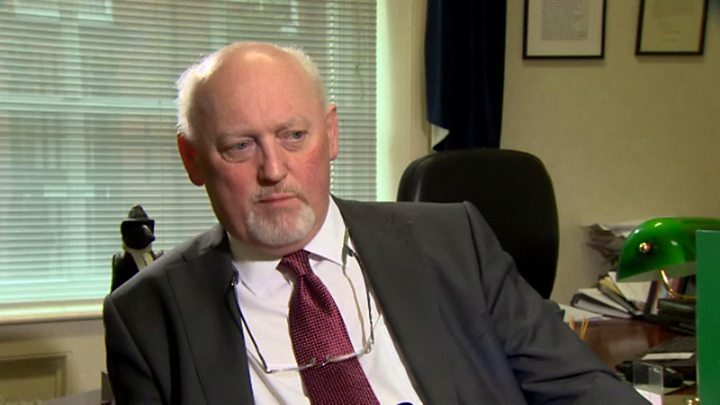 And one of Northern Ireland's leading judges has said if the law was introduced in NI it would have a major impact for domestic abuse victims. The BBC's The View examined the issue. District Judge Barney McElholm has told the programme that "if right law is enacted and the prosecution, police and courts are given the right tools, then we can more effectively combat domestic abuse". "Domestic abuse at a 10 year high"
Incidents of domestic abuse in Northern Ireland have reached a 10-year high with the Police Service of Northern Ireland now responding to 78 reports of abuse in the home every day. That is one report every 18 minutes. Justice Minister Claire Sugden has told the programme that tackling domestic abuse is her number one priority and said she is minded to bring in the new law dealing with psychology abuse. She said that she expected the relevant legislation to be enacted in Northern Ireland within "the next year". "I am committed to changing the law in this area," she said. "Coercive control will be outlawed in Northern Ireland within the next year." But Ms Graham said victims cannot afford to wait any longer. "I don't know what the hold up is. Bring it in now, not next week not next year... because it is going to save lives." she said. She said her mental health was badly affected by the abuse. "I am left with a condition I suffer with every single day because of the experiences I had at the hands of that man. The longer it is left, the more people's lives are in danger. So the justice minister needs to act now." Ms Graham suffered four years of physical and sexual abuse by her ex-partner Greg Logue. 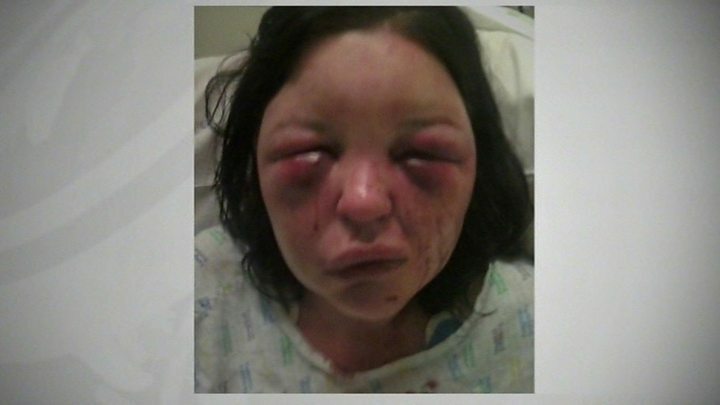 After one attack in 2011, she was beaten so badly she said she was unrecognisable to her family. He is now serving a lengthy jail term and is not due for release until 2020. "Even though people look at that photograph of me and say 'look at what happened to you'. "But what happened around it was much worse, not knowing when one of those beatings was going to come, not knowing when he was going to sexually assault me on the street. "I was raped over people's garden fences," she said. "Those are the most degrading horrible things you could go through. You didn't know when it was going to happen next so that fear and that control is the worst. So the psychological side of being in an abusive relationship is much worse than the physical attacks." The legislation which is being used in England and Wales deals with psychological abuse. It targets those who subject spouses, partners and family members to psychological and emotional torment but stop short of violence. Those convicted of "controlling or coercive behaviour" could face up to five years in prison. Judge McElholm told The View that he would welcome any move to bring the law in here. "I can see how perpetrators seem to realise how they can domineer and coerce and subjugate the will of their partner without breaking an existing law but, at the same time, ruining the life of that other human being," he said. "So, I feel if the right law is enacted and the prosecution, police and courts are given the right tools, then we can more effectively combat domestic abuse. " The judge also admitted he sometimes feels helpless when the alleged domestic abuse victim withdraws from a prosecution case. "I can understand why a particular victims may want to withdraw their evidence, there is all sorts of pressure on victims - 'he is the father of my children, she is the mother of my children, I don't want to be responsible for sending that person to prison'. "That's a flavour of the many and complex pressures that are brought to bear on a victim. And it does get frustrating when the matter is withdrawn, particularly if the defendant smirks as they exit the courtroom. "You feel that person hasn't learned anything and nothing is going to change," the judge said. The justice minister said she is looking at the laws on domestic abuse. "I do think that if we can go someway to addressing domestic violence, we will address a lot of the problems we will find within our society," Ms Sugden said.